LEDSOLUTION provide LED display with multi display sides. For example, 4-sided LED display. We make indoor and outdoor 4-sided LED displays, with various pixel pitches optional, such as 2.5mm, 3mm, 4mm, 5mm, 6mm, 8mm, 10mm, etc. The corner with 90°angle between every 2 sides are specially designed and customized, so that this part will be as seamless as possible. No obvious gap at all. We can display the same or different contents on each of the 4 sides, or display only one complete video or image on all 4 sides. It’s easy and flexible. With 4 display sides, 4-sided LED display will catch people’s attention from all directions. Therefore, it takes full advantage of the space and viewing angles. 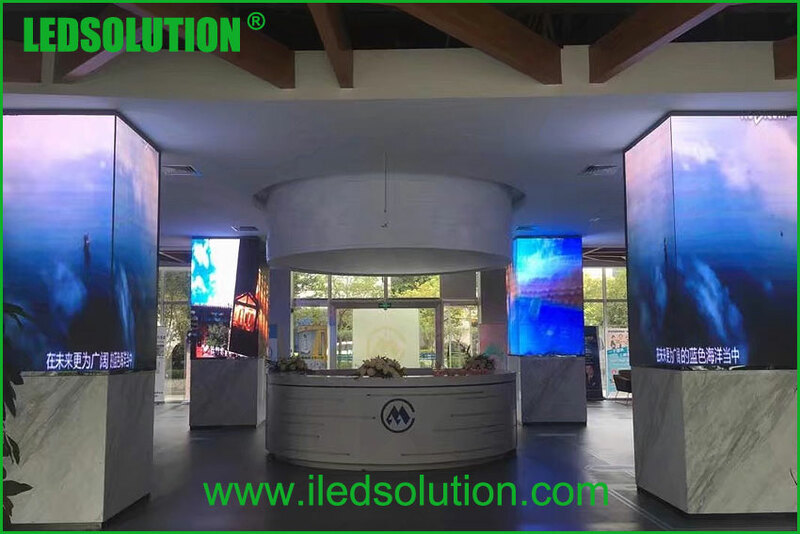 Meanwhile, when we install a 4-sided LED display on the boring and dull columns or pillars, it’s also an amazing decoration to the columns and pillars. The image of the site immediately gets improved. Except 4-sided LED display, we also provide other multi-faces LED displays. For example, 5-sided LED display, 6-sided LED display. Just let us know your request. LEDSOLUTION will offer you a perfect solution. Need help with led display solutions? We are experts!